Republican Senator Chuck Grassley today said if Hillary Clinton’s the next president, he will not “stonewall” any person she nominates for the vacancy on the U.S. Supreme Court. “I think we have a responsibility to very definitely vett, if you want to use the word vett, whoever nominee that person puts forward,” Grassley said during a conference call with Iowa radio reporters. On Monday, Arizona Senator John McCain said Republicans in the Senate “would be united against any Supreme Court nominee that Hillary Clinton” sends to the senate. McCain’s spokeswoman later said McCain would “thoroughly examine” the record of any person Clinton might nominate and vote for or against that person based on that record. 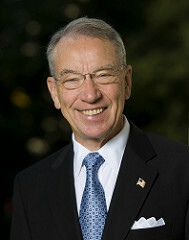 Grassley is currently chairman of the Senate committee that holds hearings for Supreme Court nominees. He has not scheduled one for President Obama’s choice to fill the Supreme Court vacancy. Grassley has been saying since February that the next president should make that choice. “If that new president happens to be Hillary, we can’t just simply stonewall,” Grassley said today. In other Senate Judiciary Committee business, committee staff who work for Grassley and other Republicans have co-authored a report on obstacles faced by federal agency “watchdogs” known as inspectors general. “The report found that more than 15,000 recommendations by inspectors general to improve agency actions have not been implemented,” Grassley said. The Republican staffers’ report concludes $87 billion could have been saved if those recommendations had been followed. “That’s not the kind of fiscal responsibility Iowans expect of their federal government,” Grassley said. The Pentagon has failed to implement more than 800 cost-saving recommendations from inspectors general. The report from staff who work for Republican senators on the Judiciary and Homeland Security Committees did not indicate the time period during which the 15,000 cost-savings recommendations had been made. A news release indicated some recommendations for one agency had been made 15 years ago.